During World War Two appeared in the United States of America a Radar Magazine, in which they passed on general information on to those involved in the Electronic Warfare (EW) fields. Although, its content is of none scientific relevance, it, however, is showing the "state of the art" of information on "what the status of radar technology and tactics on the enemy’s side" was. I have transcribed some articles which appeared between 1943 and 1945. In some respect it shows, that inside the Allied radar community, they were obviously well aware of progress in recent German radar technology. Considering the freedom of speech of these articles, it is evident that its content was then restricted to a limited reader group. It is, nevertheless, difficult to understand why postwar historians have generally neglected so many interesting points. I have chosen to add, be it especially earmarked, additional information, to enhance the understanding of the context and/or its technical implication. To give the devil his due, the Germans have developed a first rate system for anti-aircraft fire control-for which Allied bomber crews have developed a healthy respect, and for good reason. Too often they have watched it punch substantial holes in their formations - night or day, clear or cloudy. This consistent accuracy under both "seen"and "unseen" conditions is the handiwork of radar-most particularly, the Small Wurzburg. It is standard equipment for all German AA (Anti-Aircraft, AOB) positions, and its effective equipment. Angular accuracy is high (in one test of a captured set 80% of the readings were within .2° and 60% within .1°) and elevation accuracy above 17 ° is equally good. Effectiveness of the Wurzburg has been bolstered further by plenty of practice on the part of their crews and by the very multiplicity of them. The Wurzburg "seeing eye" is good enough to pick up a single heavy bomber at 35 km. and transmit continuos range, bearing and elevation data automatically to the computing device (also known as "Predictor" the Germans called it "Kommandogerät", AOB). Originally produced in 1939, the Small Wurzburg-a mobile decimeter radar (wavelength 50-60 cm.) -has been modified several times. The latest edition, Type D, owes its accurate direction measurement to an off-focus rotating dipole giving split in both azimuth and elevation (known as conical scan, which principle was invented and patented by Telefunken, since 1937, AOB). German flak (Flugzeugabwehrkanone, AOB) is most deadly, when it can combine Wurzburg range data with optical angular data-which means that radar has the added job of searchlight control for night attacks. When optical DFing is possible radar takes over for complete control. 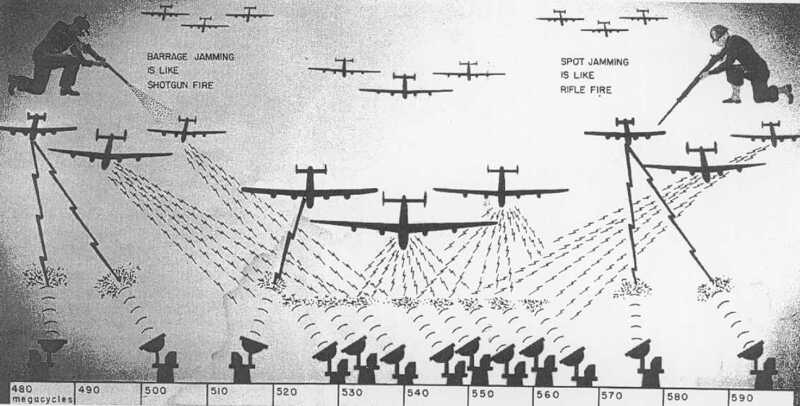 The density of these radars is such that Allied bomber groups are normally tracked simultaneously by half a dozen, while 12 or 14 may be brought to bear over the target (in a post-war US research report by Division 15, they gave figures of up to 20 radars focussing on each aircraft, AOB). There is little wonder that our bombers run into flak trouble over targets like Hamburg, where 240 guns were arranged within an 11 mile radius, or Kassel, with 110 guns in a 4 mile radius. That’s a lot of flak for any formation to dodge, and there’s even more now that Germany has concentrated its defences in the Reich. Allied Air Forces haven’t taken German flak siting down. The situation has given rise to waht might be called a war within a war where ant-flak and anti-aircraft produces vie for supremacy. We jam their GL radar-they counter with new frequencies and techniques-we reply with higher powered jammers and improved tactics-and so it goes. The following pages report on this countermeasures war in the light of some new developments in it. Its pros and cons might well be borne in mind as military emphasis shifts to the Pacific, for hard earned anti-flak experience against the Hun can be effectively used against the Nip. It is increasingly evident that Japanese flak is losing some of its inconsistency-our planes aren’t getting as many free rides as they used to. As the noose tightens in Europe, lessons learned there will have to be applied more and more in the Pacific. These pages tell what some of the lessons have been. The German fire control radar system continues to be a major threat because it is both accurate and fluid. Under fast changing battle conditions the Germans have been able rapidly to adjust their radar pattern to meet new situations. Because of the flak problem has continued to grow in spite of effective countermeasures and impressive victories. Though the Allied occupation of France took away from the Germans their elaborate advanced early warning and GCI radar network, the flak control has been, if anything, improved. Allied advances have occasioned a shift of emphasis -Small Wurzburg have been wheeled from France and the Balkans back into the Reich and are now placed en masse around important industrial targets. Flying over these targets Allied crews are meeting just about the heaviest flak concentration ever thrown into the air. Against Allied advances in the laboratory the Small Wurzburg has been equally versatile. Our countermeasure program has been met by improved operating procedures and by at least 6 ingenious modifications of the Wurzburg to enable operators to read through jamming. In addition to this the frequency band has been extended so that now it covers more than 100 mcs (MHz, AOB). Wurzburg frequencies were formally concentrated in a band of 10 mcs wide. Several of the modifications were designed to aid operators in distinguishing between true and false ecoes. One method used the Doppler effect (radio frequency of the blip is altered by ab amount proportional to speed of the target along of line of sight) by locking the transmitter with a small oscillator ensuring coherence of RF phase between the pulses (German code-name "Würzlaus" or when using improved technology "Tastlaus", AOB). 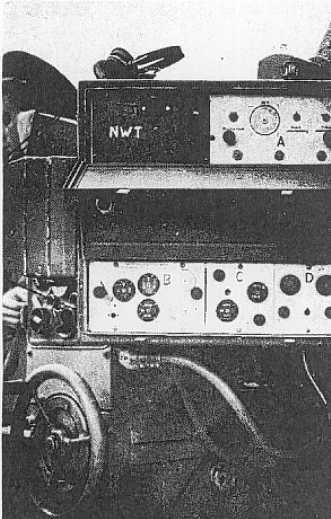 Another device used an audio presentation of propellor modulation of blips to identify the true target (German code-name "Nürnberg", the propellor modulated prf of the radar system was gated by means of the blanking pulse of the fine-range measuring apparatus EAG 62, AOB). Subsequent trends were towards simplification of the procedure for changing frequency, and alternating of the split presentation to enable split DFing on an airborne jamming signal (the problem arose, that the azimuth and elevation presentation interfered with the Würzlaus Doppler video-picture. They changed their screen presentation, from side by side, for either left-right or too high or too low, to double baseline comparison. However, reducing the simplicity of DFing to some extent, AOB). Initially these modifications were thought to be ineffective owing to a serious loss in range involved in making them. According to evidence from prisoners of war captured in Normandy the modifications and are held to be of real value by the enemy. Practically all Type D Small Wurzburg in the Cherbourg area were fitted with some or all of these modifications. Effective jamming of Wurzburgs has encouraged the enemy to experiment with altogether new devices. His latest is the Mannheim (in specifications comparable with the famous American Type SCR 584, AOB), already beginning to appear in the field. It seems to be developed of the Small Wurzburg with more power. Its range, bearing and elevation operators look at meters rather than at scopes (as to increase their overall system accuracy; screen presentation was also available. Telefunken thought, that measuring of distances of a few metres only, can hardly be accomplished by reading from a radar display or CRT, AOB), and track planes by tuning controls to keep pointers at the centre of dials. It is highly probable that Germany is working on newer types of fire control. Expectations now are that German radar with PPI presentation-at long last-will be operational in quantity very shortly (very true, meant was the Jagdschloss radar apparatus, AOB). The advantages of microwave still seem to be out of the German radar world (this is not correct, as the Berlin apparatus was due to appear in the field although, be it in limited quantities. Some 100 sets were operational when the hostilities ended on the European continent. The Berlin radar Type FuG 224 operated at 9.2 cm, the Berlin PPI unit can be found on our page "Exhibits", AOB). There is evidence of a microwave point to point communication system in the range of 15 to 23 cm (meant was the Stuttgart apparatus, which had been designed by C. Lorenz, de facto a subsidiary of IT&T of America, AOB) but no conclusive indication that such wavelength are in current use for radar. Allied countermeasures, in meeting the German flak problem, have brought about enough reduction in flak losses and damage to constitute a major victory. They cannot, of course, stop flak completely. Their use has generally forced the enemy to use his less accurate visual range finders under "seen" conditions of fire control, and to fall back on less effective barrage fire against many blind attacks. The resort to visual range finding is more handicap than it might seem at first blush. It makes for substantial cut in the length of time one of our formations may be engaged, provides only spot readings instead of a continuous measurement of range to the predictor, and gives a less accurate measurement of slant range. Sharpest reductions have come when the target was smoke or cloud covered, but they have been considerable even in good visibility. Responsible for the results are chaff (aluminium strips for creating false echoes)(the British called it "Window", AOB) and noise modulated transmitters for electronic jamming. And along with these measures time proven tactical procedures are in constant use. Formations flying over flak protected targets pay particular attention to spacing between planes, altitude and axis of attack. It is the combination of tactical and radar countermeasures that made our anti-flak program effective. Of the transmitters, Carpet has been able to deal the most telling blows to the Small Wurzburg. Carpet seems to be about the best answer yet to Germany’s accurate fire control and recent applications and improvements indicate a considerable rise in its effectiveness. An all-out Carpet program has been held up heretofore by lack of equipment. But equipment is now arriving in the theater in substantial quantity - enough to allow a current installation rate in excess of a group a day. Installation crews have been set up to speed the job. Carpet I, the original jamming transmitter, has been supplemented by a big brother, Carpet III, with about 4 times the power and jamming ability. And equal quantities of both sets are about ready for action in the biggest countermeasure program yet attempted. Prior to Wurzburg improvements, "barrage" jamming was accepted Carpet procedure (barrage signals were noise modulated broadband signals, consider my book "Deckname Würzburg", which shows on page 73 the spectrum of the British Carpet equivalent, noise generator, AOB). With this system the transmitters are pre-tuned to a fixed frequency before take-off, each Carpet on a different frequency throughout the Wurzburg spectrum, in an attempt to blanket the entire band. This makes for effective jamming, but to accomplish iy each plane must be equipped with several transmitters-a large order. The lack of sufficient quantities of equipment in the theater-and the effects of German anti-jamming work-encouraged the perfection of the "spot" jamming technique. With this system Carpets are tuned in the air against exact Wurzburg signals, as detected by an airborne radar search receiver. The point off the spot technique is to produce a maximum jamming of the most dangerous GL radars with a rather limited number of operational installations- and it does just that. During July sorties over flak-defended targets one bomb group using Chaff and barrage jamming with Carpet I had a 2.55% loss to flak, and 5.5% major damage. During August spot jamming went into effect in the group and loss fell to .4%, major damage to 0.8% (whether these figures are valid may well be questioned. The situation had changed dramatically for Germany, and one never may extrapolate data and circumstance in these kinds of chaotic circumstances, AOB). As barrage jamming is analogous to shooting a shotgun, spot jamming is like shooting with a rifle. This rifle is Carpet I and its sight the "Blinker"search receiver-Wurzburg serves as the rabbit. The jamming procedure amounts first to detecting the GL signal with the search receiver (sighting the rabbit), then tuning the jammer to that signal (drawing a bead and firing). If the Wurzburg changes frequency when the jamming starts (rabbit starts to run) the operator can follow with the receiver and still fire effectively. Using the search receiver and a bank of 3 Carpets adapted for spot tuning, the 3 strongest GL signals can be picked out and jammed. As the plane moves beyond range of one jammed radar the RCM operator retunes the Carpet to new stations emitting stronger signals. It was once thought that barrage jamming with 2 transmitters in every plane would more than blanket the Wurzburg band; now, in view of the Wurzburg frequency spread, and our tendency toward smaller formations, it appears that barrage alone on such a scale would be inadequate. A large scale spot program might provide a quicker solution to the problem, but such plan would require an additional specially-trained man for every Carpet plane. The solution lies in a combination of barrage and spot jamming, as pictured below. Jamming pattern to screen all planes in a formation against gun laying Wurzburgs is shown. 2 or 3 spot jamming planes per combat box, each with 3 transmitters, jam straggler frequencies while 2 Carpets in every other aircraft barrage crowed parts of the spectrum around 560 and 530 megacycles. This desirable situation is rapidly becoming fact with special teams in the theater installing Carpet I and III in a group per day-one 8th AF division is already equipped. What we have learned so far is, that Allied RCM practice focussed mainly on blanking (blinding) the German radar systems. But, this could only be sustained because the Germans had no resources to bring in new technologies in to the battle theatres. They were, however, working on anti-aircraft-rockets, which were still in an experimental stage. Do not forget, that jamming signals may also be a real source (target) to home at. One could pinpoint the jamming platform and direct flak gunfire onto it. This consideration yields even today, rather significantly. And, it would be all too simple, to believe that the overwhelming superiority of Allied forces had solved all future electronic warfare concerns, AOB! How soon can Germans produce them? There are two schools of thought considering the deficiencies of German radar. One has it that the Germans are good deal further advanced then they seem to be and are simply holding off their radar treasures for a later day. The other believes that captured equipment P/W information, intelligence, reconnaissance and operations fit together to make a picture which shows the Germans making full use of all they’ve got. The division between the two schools, and the tentativeness of both, are natural enough: it’s no clinch to find out the precise state of the enemy’s resources in any field, let alone the fluid field of radar. But even here glimmers of certainty show through. Thus it is quite certain that that British losses of H2S equipment and U.S losses of H2X (the APS-15 sets) have presented the Germans with the PPI technique and, in the case of the latter, with the microwave principle. If they didn’t know the workings of these before, it can be fairly well assumed that they do now. Chief questions remaining is how long it will take the Germans to turn knowledge into production. Characteristics and advantages of H2S and H2X were dealt with at some length in the April issue. Microwave and PPI functionings serve, of course, many purposes other than bombing and navigation, and their contribution to German use may be made most notably in GCI operations. The German method of putting their GCI radar data into map posistion and height for plotting has been ponderous, cumbersome and time-consuming, and most of the involvements come from the need to work out mechanically and indirectly the information which the PPI technique provides directly. Microwave radar is just a better radar. To put both to work will cost the Germans vast overhauling of present installations and procedures. It is expected that the cost will be paid. It used to be, and not so long ago, that the characteristics of enemy radar had to be figured out by guesswork, trail and error and elaborate sliderule sleuthing. One of the happy consequences of pushing the enemy back is that such labors are minimized. Captured equipment can answer a lot of questions. Recent drives in the Pacific, Italy and France have added considerably to the Allied collection of second-hand radars (hence, this paper must have been written after about August 1944, AOB). Some of the items gathered up on all three fronts are shown here. Any equipment taken in reasonable good condition, like the Wurzburg across the page, goes at once to testing centers (this set might have been brought to Farnborough in late 1943, AOB). AJ panel on Small Wurzburg. "NWT"is for Nurnberg (propellor modulation device), Wurzlaus (moving target discriminator), Taunus (wavefront discriminator). All of these anti-jam devices cut range. As every airman over Germany knows, Jerry has gone all out for gunlaying-gunlaying radar and heavier AA (anti aircraft, AOB) batteries-and it’s a powerful combination. Installations which used to have 4 guns now have as many as 32, largely made up from guns moved in from outlying regions to be concentrated on choice targets in the heart of the Reich. In other words, the flak is thick and tough. Allied countermeasures are tailored to suit. They are tailored of a variety of equipment and techniques and out of the total product of RCM experience on the part of all U.S. Air Forces active over Europe. A lot of this experience was gathered in its roundup of RCM activities and German radar developments of which are now being well applied in other areas. From May to August 1944 there were very few days-perhaps 4 or 5 when the 15th AF did not go bombing. And one of their regular targets-Ploesti (Rumania’s main oil fields, which were of utmost importance to Germany’s warfare. According to U.S. Division 15 post-war final report, this area was the second strongest defended theatre, AOB) -put up a solid wall of fire every time. Flak from Ploesti guns was even worse than that from Europe’s No. 1 target, Berlin, because of the tight area in which the oil refineries were located. On several raids at least 245 heavy AA guns were identified. As many as 25 batteries of heavy guns (8 guns to a battery) would regularly be brought to bear hard on one bomb Group at a time. Primary flak control in every case radar. There was always one radar set for every battery, sometimes 2. After the capitulation of Ploesti an RCM deligation from the 15th AF visited the refineries, talked to some of the Rumanians who had been manning the Wurzburgs. Located 35 miles north of Bucharest, the capital of Rumania, Ploesti was a massive complex consisting of seven major refineries, storage tanks and related structures covering 19 square miles. The importance of Ploesti can be judged by the fact that it supplied Germany with 1/3rd of its entire fuel oil needs. It's not too surprising than that it was also the first target in Europe bombed by American aircraft. In May 1942 Colonel Harry A. Halverson led 23 factory-fresh B-24s from Florida on an epic flight that was supposed to finish in China. Known as HALPRO (Halverson project) the unit was going to bomb Tokyo in a follow-up to the Doolittle raid. When HALPRO reached Egypt however, the crews were ordered to stay put and prepare to bomb the oil refineries at Ploesti. The mission (the first US raid of the European war, top secret at the time and later overshadowed by the disastrous low-level Ploesti raid of 1943) was set for June 12th. The aircraft took off individually between 10:30 and 11:00 pm on June 11th, arriving over the target at dawn the following day. Ten bombers hit the Astra refinery at Ploesti, one B-24 attacked the port area of Constanta, the remaining two B-24s struck unidentified targets. Three ended up interned in Turkey, the rest manage to reach friendly bases in Iraq. Damage turned out to be minimal but the mission was considered a success. Operation Tidal Wave was designed to be an all-out maximum effort against the Ploesti oil fields. Colonel Jacob E. Smart, a member of the Advisory Council first came up with the idea of striking Ploesti at low-level with heavy bombers. It was a gutsy some felt suicidal plan but it went up the chain of command and got the backing of General 'Hap' Arnold and the president. Planning was meticulous including two full-scale practice missions against a replica of Ploesti built in the desert. Since Ploesti was located north of heavily defended Bucharest it forced any attacking force to divert around the capital to have any chance of reaching the target unmolested. This was a key feature of Operation Tidal Wave and it called for precision navigation and strict radio silence. Despite careful preparation the operation was marred by bad luck from the start, one B-24 crashed on take-off. Since the mission was flown in radio silence the bomber groups became somewhat separated on the long flight across the Mediterranean. Then just off Corfu, Greece the lead aircraft carrying the route navigator inexplicably plunged into the water. A second plane of the 376th with the deputy route navigator followed down to see if there were any survivors. Unable to regain formation the bomber turned back to base. This left the lead bomber group without the expert navigators to guide them through the difficult low-level approach to the target. Thick clouds greeted the incoming bombers as they approached the mountains. While the two lead groups threaded their way through or under the cloud layers the 98th, 44th and 389th crossed at various altitudes. By the time these three bomber groups were formed up and heading for the first IP (Initial Point) they were 29 minutes behind the 376th and the 93rd. Meanwhile not knowing if the other bomber groups were forced to turn back or not the 376th and 93rd made their turn at the first IP of Pitesti toward the final IP of Floresti. However, halfway to the real IP the 376th mistook the town of Targoviste for Floresti, an error that wasn't discovered until they were on the outskirts of Bucharest. At that point Major Gen. Uzal Ent broke radio silence and ordered the two groups to turn north and attack targets of opportunity in the complex of refineries. The carefully worked out bombing plan was foiled as bombers struck the wrong refinery or attacked any target that looked good. German fighters pursued the bombers as they left bringing down more than a few damaged aircraft. Of the 177 bombers that took part in the mission 54 were lost, a further 53 planes were heavily damaged. It was a costly victory by any measure. The damage to Ploesti was significant but offset by its spair refining capacity and the fact that a raid like this could not be mounted again for quite some time. April 5, 1944 began. 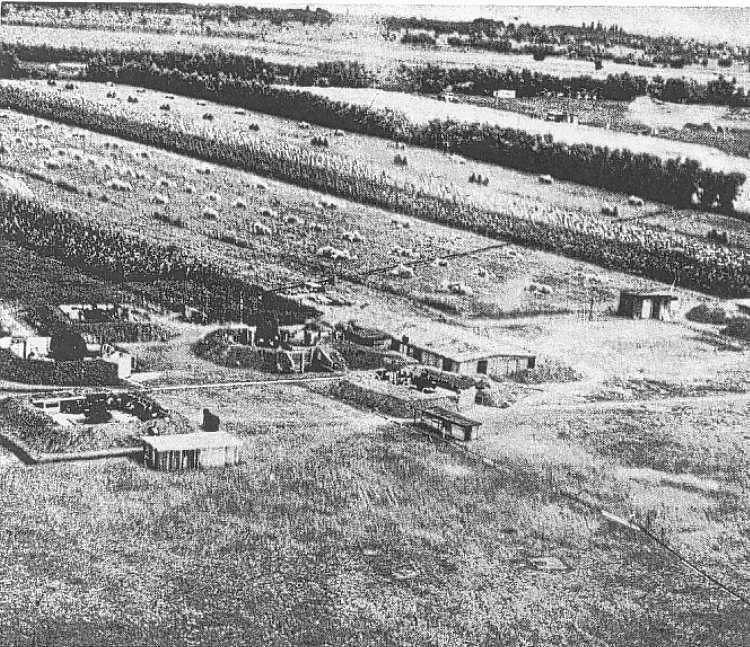 Between April 5 and May 5 the 15th AF attacked the marshalling yards at Ploesti four times, losing 43 heavy bombers shot down and a dozen more in crash landings. May 18, 1944 - the 15th made its first direct attack on the refineries. On June 10, 1944 46 P-38s took off from Vincenzo to attack the Franco-Americano oil refinery at Ploesti. The 46 P-38s carrying one 1,000 lb bomb apiece, 8 planes soon aborted, the rest pushed on. 36 bombs were dropped successfully and a oil-cracking plant, oil tanks, and other facilities are damaged or destroyed as well as a variety of ground targets that are strafed by the Lightnings. Losses are heavy included 14 1st Fighter group P-38s and eight 82nd Fighter Group P-38s. 33 Axis fighters were downed during this mission. 2nd Lt. Herbert B. Hatch, a P-38 pilot 1st FG 71st Fighter Squadron became an ace-in-a-day by shooting down five and possibly six Romanian Air Force IAR.80 fighters over a Romanian airfield near Ploesti. 1130 hours. 1st Lt. Armour C. Miller, P-38 pilot 1st FG 27th Fighter Squadron achieves ace status when he downs a Bf 109. June 23, 1944, in one of its major strikes, the Fifteenth sent 761 bombers to Romanian oil targets. July turned out to be the costliest month for the 15th Air Force and the height of its bruttle campaign against Ploesti. August 19, 1944 - last mission to Ploesti. August 30, 1944 - Red Army troops capture the burned and twisted wreckage of Ploesti. Let us continue with the Radar papers. Fire control, they found, came from the tried and true combination of Small Wurzburg GL sets helped out operationally by the Giant Wurzburg-Freya GCI setup .... . When the 15th jamming interfered, gunlaying was accomplished by acoustical means. In clear weather optical range finders were useful, but never as efficient as the Wurzburgs. 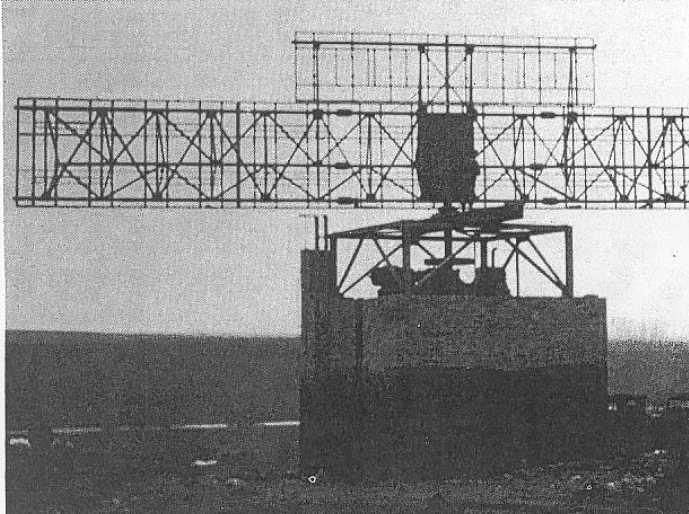 The intense RCM war on this A-1 installation was preceded by a lot of background work on the part of the 15th countermeasures experts. Days were spent log checking, flying ferret missions to pinpoint German radar installations and note their operating frequencies, making maps of all target areas to show gunlaying and AA installations. The 1044th Sig. Co. set up a school in the Chaff, Carpet and Wurzburg. Master site for radar control of German heavy AA baterry near Ploesti, Rumania. Two Small Wurzburgs and 3 Kommandograt directors control the guns which can be seen firing at upper right. Radar at left is probably the one tracking flight from which this photo was taken. B-24 flying through heavy flak is visible just above horizon. Knowing their Wurzburgs are going to be jammed, the Germans are spreading frequencies more widely (this procedure was forced after British special forces captured some significant parts of a Würzburg Type A apparatus at Bruneval, in late February 1942. This set was the least advanced version, it, however, passed on quite some information. Consider our transcription of the official TRE Bruneval Report of Spring 1942 on our introduction or index page. The German code-name for spreading of the operational frequency was "Wismar". In fact, in the case of Würzburg, as it had been designed as to have a stable as possible working frequency, this made, in first instance, varying its operational frequency a rather difficult task, AOB); mounting low frequency radar at Wurzburg sites to take over when the higher frequency stuff is jammed: trying out anti-jamming circuits. And they are developing a new computer which enables one radar to control a large number of AA batteries simultaneously. Against all of the 8th AF is doing plenty, some of it detailed below. Close to 7,000,000 units of Chaff are tossed out by the 8th AF in a month, and the greatly expanded Carpet program, which began in the fall when Carpet jammers began to arrive in quantity, is now in full swing. Now all 8th AF Bomb Groups operate barrage jammers on every mission-some using Carpet I, but most now using Carpet III, a higher powered jammer more effective are crippling Wurzburgs operating in a narrow frequency band. Spot jammers are in use in all Groups in the 2nd Division, and in most Groups of the 1st and 3rd Divisions- and there is more coming. Jerry’s reaction to all this jamming is to hunt for new frequencies or, more often, simply to shut up shop and wait until it blows over. Germany has been pulling back a lot of big guns and a lot of gunlaying radar before advancing Allied Armies. But not all. RCM investigators, going in to pick up Jerry’s radar pieces, have found no startingly new techniques or tricks, but one new German radar set, a GCI radar known as Jagdschloss. Herewith a brief report on that. In November 1944 an RCM delegation paid a call on what was left of a hastily abandoned and incomplete German radar installation at Aisemont, in Belgium. They had seen pictures of this set, and dubbed it an "Extended Freya" for want of a closer look and a better name. It proved to be Jagdschloss-an equipment designed for GCI work and the only new German radar set to make an appearance in recent months. This was the equipment which, according to P/W reports, made use of the first German-made PPI scope. During the summer various sources had made it clear that Jagdschloss existed, but it remained for photo-reconnaissance to fill in the picture. Seven or eight installations have been identified by photographs since the first picture was made by the British, who sent a plane on a spectacular flight over the site at Tybjaerg, on the Island of Zeeland (as this was on Denmark’s soil, it must be "Seeland", AOB), to obtain the first detailed oblique shot. Jagdschloss antenna, 80 by 10 ft. and continuously rotating, sends out a narrow beam that's hard to jam. Small upper array is IFF. 7 or 8 of these newest GCI radars have been identified in reconnaissance photos and are believed to use the Panorama Ger, first German PPI (is not entirely true, AOB). The set has a wide frequency band and estimated range of 60 miles. Antenna consists of wideband dipoles 1 meter long. Iff unit is vertically polarized. Putting the pieces together, we know that the Germans were busy completing the Jagdschloss stations during the summer and fall (it may be estimated, that the Germans installed about 20 Jagdschloss all together during WW II, AOB). It is unlikely that the chain of stations-about 80 miles apart-is completed yet, but if and when it gets into full operation oit will probably cover most of Germany. In some cases, as at Darmstadt (near Gernsheim) and at Weisenfels (southwest of Leipzig), a Chimney has been erected for heightfinding. RCM groups, studying Jagdschloss’s capabilities estimate that its reliable range is about 60 miles. The large (80' x 10'), continuously rotating aerial sends out a narrow beam, which helps against increasingly successful Allied jamming. The small upper array is for IFF. No aerials, power supply or other radar gear had been installed at Aisemont before the Germans were forced to get out, nor could evidence of any be found there. Details of the antenna framework, however, were helpful in confirming siting and antenna studies. A technical team visiting a GCI site at Mars La Tour a few days after the trip to Aisemont, found an old type Giant Wurzburg-Freya station left in the process of being jazzed up with a Jagdschloss-Chimney combination. There was plenty of radar: two Giant Wurzburgs, a Limber Freya, a pole Freya, a Box Girder Chimney, and the Jagdschloss-the last two incomplete. Local French, who had been working on the site, told visitors that the installation, started last August, was to be complete by first of 1945.